For over 20 years, LUTECE LANGUE has provided French language courses for foreigners, both professionals and individuals. Our French courses are in small groups of 2/7 students and cover from beginner to advanced levels. Needless to say, all the students are placed in a class according to their current oral, writing and comprehension level. We adopt a “direct” teaching method (teaching French in French without translation) because we believe it’s the most efficient approach to developing students’ communication skills. In fact, our goal isn’t just to teach French grammar and vocabulary. Rather, we focus on teaching how to use tools (grammar and vocabulary) in the act of communication. INTENSIVE PLUS: For STUDENT VISA application. SUPER INTENSIVE 30h: available from A2. Check program details. This course is also eligible for BILDUNGSURLAUB. Afternoon Thematic WORKSHOPS: conversation, writing, pronunciation, preparation TCF/DELF, etc. Private FRENCH LESSONS via SKYPE: conversation, grammar, preparation TCF/DEFL, etc. 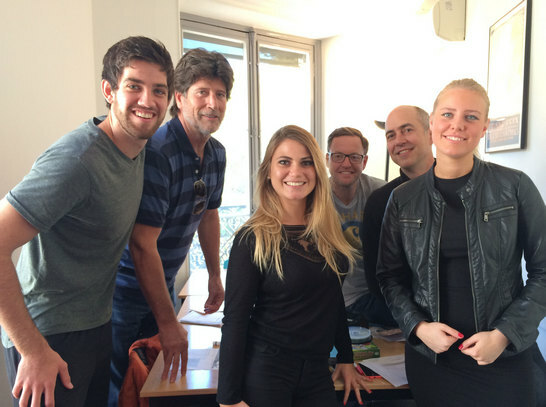 Learn French in France with our French courses in small groups! Give yourself the best chance to develop your “communication” skills with our French immersion courses in Paris. Our French program is designed for adult students (18+). Learning general French gives you a foundation of communication in daily life. Also, General French is indispensable in order to learn Professional French. Our French courses in Paris could be a part of a preparation for French exams such as TCF/DEFL. * CLASS SCHEDULE: The school decides the class schedule according to student’s French level. You will receive a confirmation before Thursday of the week prior to the starting date. All the students are requested to take an oral and written placement test 2 weeks before the starting date. INTENSIVE & STANDARD: We recommend INTENSIVE (15h) if you wish to improve your French skills efficiently in a short period of time. A STANDARD course will be a good option if you can stay in Paris for a while and wish to take French lessons regularly. EXTENSIVE: If you are not available during the daytime because of work or studies, we recommend EXTENSIVE Saturday and Evening French lessons. However, please note that this course is not adapted for intensive learning. “COMBINED” COURSES: Do you need a “very intensive” French course for a short period? Or, do you want to reinforce specific skills in addition to building a foundation of basic French? If so, we advise you to combine WORKSHOPS / PRIVATE LESSONS with weekly French courses. AFTERNOON THEMATIC WORKSHOPS – You might already know which particular French skills you need to strengthen to achieve your objectives: to find a job, to better communicate in your workplace or daily life, to be successful in your studies or to pass French exams such as TCF and DELF, etc. Unlike other main French courses, the thematic WORKSHOPS aim to improve specific French skills such as conversation, writing, pronunciation, etc. and are conducted in small groups of 2-7 students. You can choose the themes of the workshop according to your needs. It is possible to take them with or without INTENSIVE /STANDARD courses. More information here. PRIVATE FRENCH LESSONS IN PARIS – If you study French in France with LUTECE LANGUE, it’s a good chance to work on specialized French or to concentrate on strengthening your weak-points in general French. Private lessons are a flexible and customized formula as you can decide the theme and the rhythm of lessons. It would be the best option if you need to develop technical vocabularies related to your specialization or reinforce your needs in general French. More information here. PRIVATE FRENCH LESSONS VIA SKYPE – The key for quality Skype French lessons is obviously the teacher. Discover our Skype French lessons with selected, qualified and experienced teachers! You can take Skype lessons BEFORE and AFTER your French class at LUTECE LANGUE. It is also possible to take only Skype lessons without classes. Private French lessons via Skype are almost like private lessons at the school. More information here.